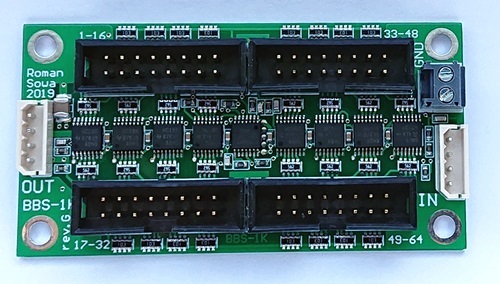 BBS-1K stands for Bus Bar Scanner for one keyboard. It has daisy-chain input, so another scanner of any kind can be connected to it. This way you can connect up to 8 keyboards, 64 potentiometers and control keypad to MRG3 controller board, which has only 4 inputs. Or 10 keyboards with use of MRG2. Keys must have one pole of each contact connected to ground, that's typical setup in older organ consoles. Keyboard is connected using four 16-pin IDCs. One connector covers 16 keys. An example of compatible plug can be found at Mouser part number D89116-0031HK.